Since Huawei LTE router WiFi is very popular in the global market, if you want to buy a 4G SIM router for home or office, you may consider Huawei LTE routers such as Huawei B618 or predecessor model Huawei E5186. 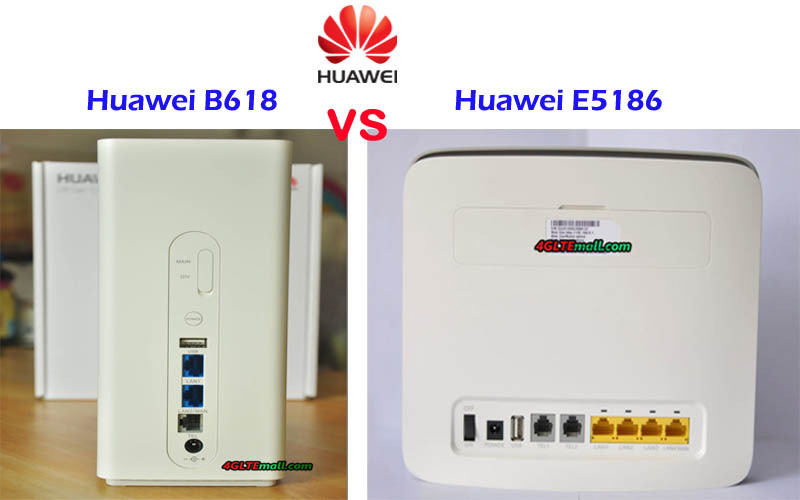 But what’s the difference between the Huawei E5186 router and B618 CPE? And which one is better to buy? The questions would be answered in this article. If you had used a Huawei 4G router, you may know the Huawei E5186 router, which is the best seller of 4G LTE-A router from Huawei. It’s in white color and in a traditional router design. On the front, there are five indicators on the front for Power, Mode, WiFi, Voice, and Signal. On the back, there are 4 Ethernet Ports for LAN (One is for LAN & WAN), two Telephone ports and one USB 2.0 port. The Huawei B618 4G LTE router is the latest new LTE advanced Pro router, which is in a new design of a Cube in white color. It also has some indicators on the front vertically for Signal, Power, Status, LAN, WiFi, Mode, among which the WPS buttons are available. The Huawei B618 Router also has the Ethernet ports on the back, but there are only two LAN port, one of which is for both LAN and WAN. Only one telephone port is available below the Ethernet port. The USB 2.0 port is above the Ethernet port. The power button and connectors for external 4G Antennas are available on the Ethernet and USB ports. The connector type is TS-9. If you need Huawei B618 antenna, you must buy an LTE Antenna with two TS-9 connectors. The Huawei E5186 also has two connectors for an external antenna on the back covering a long cap. The connector type is SMA-Female. If you need Huawei E5186 external antenna, you must buy an LTE antenna with two SMA connectors. 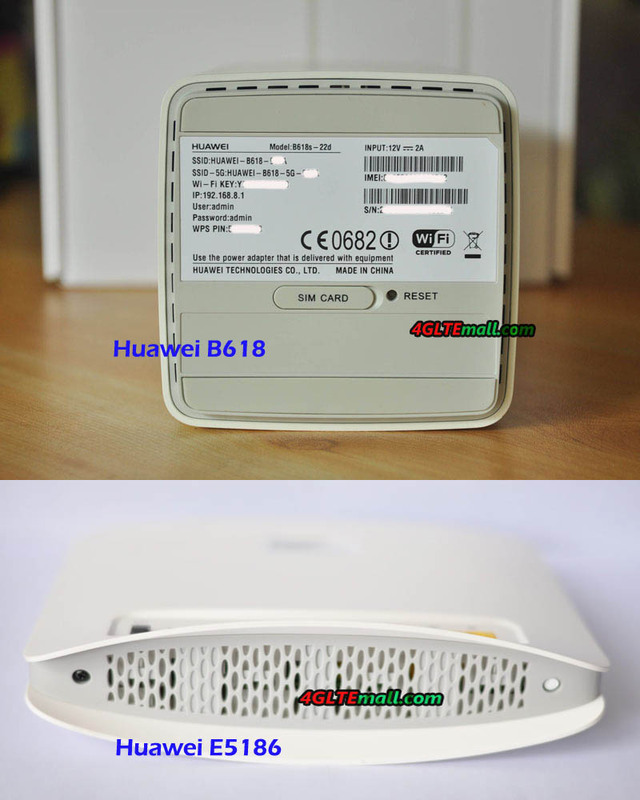 From the specs table, we can see the Huawei B618 router is more advanced than unlocked Huawei E5186 router. LTE CPE B618 could support downlink speed up to 600Mbps with 4 x 4 MIMO technology, which is almost double faster than that of Huawei E5186. The two variant models of the two routers cover similar LTE frequency bands, which mean they are designed for same areas. 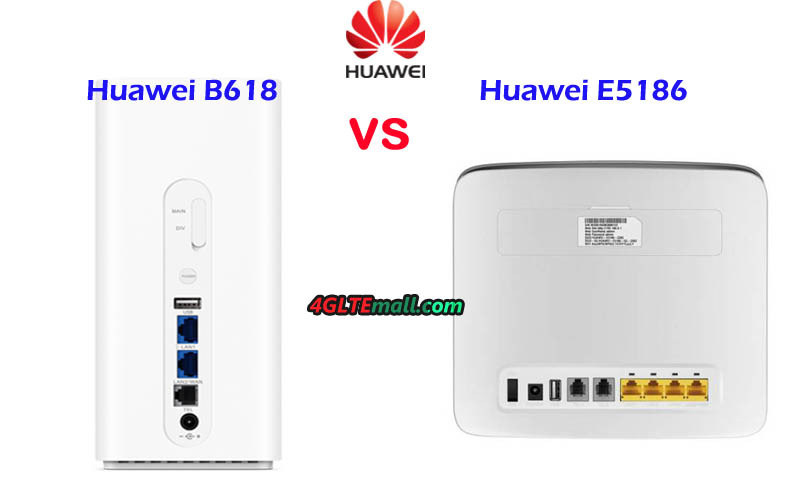 However, the advanced Huawei B618 has fewer Ethernet interfaces than Huawei E5186. 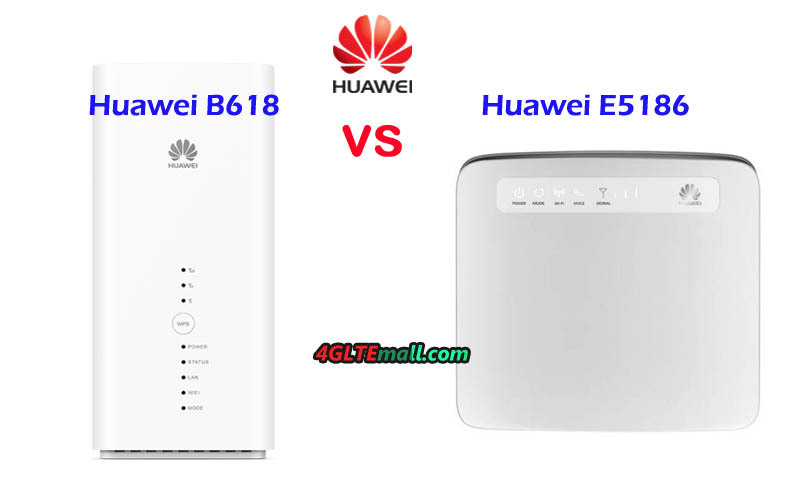 If you would use the router with more than 2 devices through Ethernet port, you’d better select the Huawei E5186 as a home or office router. However, if you use the router mainly through WiFi, the Huawei B618 router would be very good. Since the two Huawei Routers would provide wireless internet for up to 64 users, Huawei B618 provider fast internet speeds. Of course, the Huawei B618 provide faster speeds with advanced technologies, the price would be more expensive than Huawei E5186 router. So if you don’t have enough budget for B618 CPE, the Huawei 5186 is recommended, in our test, it’s good enough for most cases in our daily life.